Demag Cranes & Components has added a new model to its DCM-Pro Manulift range to accommodate increased load capacities. The new DC 5 Manulift allows users of Demag chain hoists to handle loads weighing up to 500 kg simply and safely. The DC Manulift, used in conjunction with a Demag DC chain hoist, may be used for simple and safe horizontal and vertical movement of loads with minimum operator effort. Loads may be manoeuvred with the operator using just one hand, leaving the other hand free to operate the crane control system. This provides ergonomic advantages over the use of conventional chain hoists, where the operator often needs to use both hands to lift and position loads. The DC Manulift’s control unit is rigidly connected to the load handling attachment, allowing the operator to guide the load with a central handle and, at the same time, lift and lower the load via integrated rocker switches, without having to change the hand position. This arrangement enables loads to be handled quickly, precisely and safely with fluid motions. The DC Manulift has been enhanced by the introduction of material handling innovations, such as the latest D-Grip manual force control unit. It does not need switches or buttons for travel commands, with the load simply following the operator’s hand movements via the control system handle. The DCM-Pro Manulift is well established as an efficient handling device in many production and assembly lines and is employed in numerous sectors of industry worldwide. An extension to the load capacity range is a logical step in its further development, allowing it to be specified for a broader range of heavier duty applications. The DCM-Pro 5 incorporates all of the safety and operational features associated with the established Manulift range. These include a slipping clutch, with a speed-monitoring function, which protects against overloads, as well as the clutch located in front of the brake, preventing loads from dropping abruptly. Terex Material Handling’s new generation of Demag DIR infrared (IR) remote controls provides crane operators with a viable alternative to conventional radio controls. The Demag DIR range incorporates a variety of innovative features for the reliable and efficient control of material handling systems. One of the principal advantages of the Demag DIR system over radio controllers is the considerably shorter range, of some 40 metres between the transmitter and sensor(s), which is of benefit when the operator wants to limit the distance at which the crane can be controlled, for safety reasons. This specifically limited range ensures that operators are always in close proximity to the equipment, providing a clear view of the lifting and moving process. There is no risk that the IR control system will be influenced or impaired by radio systems and the IR offers no potential for interference with other radio controls. The Demag DIR’s rugged hand held transmitter housing is based on the design used for Demag radio controls, meaning that users will be familiar with the controller layout and can use the same keypad concept for both transmission methods. DIR hand held transmitters are offered in two sizes for two stage control, with six buttons (DIR 6) and ten buttons (DIR 10) for the control of two or three motion axes, respectively. Like Demag radio control systems, up to ten crane systems may be controlled simultaneously in an enclosed area. For multiple controller operation, switchover between transmitters is monitored to ensure that the control systems are clearly assigned to specific cranes. The high contrast bi-colour display provides a clear overview of the device and warning information, which affords the highest level of safety. The integrated vibration alarm and stop function conform to Category 3, Performance Level ‘d’ to the relevant standard EN 13849-1. Convenient and simple crane control is assured at short distances, of up to 15 metres, as the rays from the high performance infrared LEDs are reflected by the surrounding structure, eliminating the need for the transmitter to be pointed directly at the sensor. High performance rechargeable batteries ensure operating times of up to 30 hours with one charge. The unit can be conveniently charged on an optional inductive charging station. 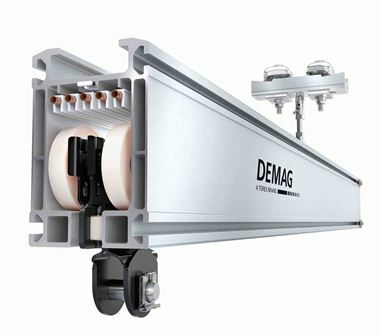 In addition to providing reliable wireless control of industrial cranes, the Demag DIR may also be used to control suspension monorails, transfer carriages and other materials handling equipment. The Demag V-type crane has won the Red Dot Award: Product Design 2015, which is a major worldwide award scheme for product innovation. The international judging panel, comprising designers, design professors and trade journalists from 25 nations, made the award in the machinery product category, in recognition of the innovative crane girder design. The Red Dot accolade follows on from the success of the patent pending V-type crane design at the prestigious iF Design Award at the beginning of February. Andreas Hambrock, Head of the Universal Cranes business line of Terex Material Handling, stated: “We are proud that the Demag V-type crane has now impressed two international judging panels. With its dynamic and translucent V-profile, our unique crane girder fulfils all the requirements of high class design.” In total, around 5,000 products from 56 countries were submitted for the Red Dot Award: Product Design, in this its 60th year. As the winning product, the Demag V-type crane will be shown from 29 June to 26 July 2015 at a special exhibition in the Red Dot Design Museum in Essen, Germany, and will be part of the museum’s permanent exhibition in the following months. The new Demag crane design is characterised by its V-shaped structure, comprising vertical struts and tapered diaphragm joints, to create a honeycomb structure, using material only where it is needed. The V-type crane also offers significant technical advantages compared with conventional closed box-section girder or I-beam girder cranes. Its innovative architecture reduces the vibration frequency by 30%, lowers the weight by an average of 17% and doubles the lifetime to over 500,000 load changes. As a result, the V-type girder concept offers significantly greater efficiency in load transport and higher handling rates. The Demag V-type crane has won the internationally renowned iF (international Forum) Design Award for its outstanding design. The award recognises the innovative construction of the V-type crane girder, which is based on bionic principles. In a similar way to bone structure, the design only uses material where it is necessary. Depending on requirements, the new girder design can be adapted with millimetre accuracy to the height of existing or planned buildings. This versatility facilitates simple implementation in existing production bays and greater freedom for planning new buildings. The distinguished judging panel, comprising members from 20 countries, recognised the crane in the Industry/Skilled Trades’ category. “The award demonstrates that our new Demag V-type crane design truly represents a revolution in the market and that industrial cranes can also achieve new levels of design excellence”, explains Andreas Hambrock, Head of the Universal Cranes business line at Terex Material Handling. 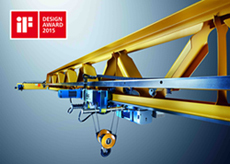 “At the same time, the optimised crane girder design makes it more precise, lighter and more durable than other universal cranes.” As an award winner, the Demag V-type crane will be shown at the iF design exhibition in Hamburg’s HafenCity from 28 February to 7 June 2015. The award ceremony was held in Munich on 27 February. iF International Forum Design GmbH has been recognising excellent design and outstanding design achievements with its iF Design Award for more than 60 years. Candidates have to meet strict criteria in order to win the renowned award. 2015 saw a total of some 5,000 submissions from 53 countries. The Demag V-type crane features a V-shaped design that includes vertical struts and tapered diaphragm joints. This construction reduces crane oscillation by 30 per cent, enabling loads to be positioned more quickly and precisely. The optimised use of material to meet specific load requirements also cuts the crane’s deadweight by an average of 17 per cent and doubles its service life to more than 500,000 changes of load. Terex Material Handling has patents pending for the new technologies incorporated in the Demag V-type crane. Terex Material Handling has launched the new generation Demag V-type crane, which sets new standards in the industry. The V-type design uses less material, helping to reduce the depletion of raw materials. V-type girders weigh, on average, 17% less than comparable box-section profile girders. This reduced crane deadweight produces less wheel pressure, minimising the forces transmitted to the existing building structure and increasing the maximum load capacity. Consequently, the new Demag V-type crane provides architects with greater freedom in planning new factory buildings. The design is also suitable for companies, who wish to employ additional lifting equipment in existing assembly and production bays. The patent pending design, which features diaphragm joints, also cuts oscillation of the crane girder by up to 30%. The reduced oscillation characteristics cause lower loads to be transmitted to the crane, its components and the building structure, doubling the service life of the crane to more than 500,000 load changes. In addition, the improved oscillation characteristics enable heavy and sensitive loads, such as glass panels, fluids or aluminium shell sections for aircraft, to be positioned more precisely and quickly. “The new V-type girder is the result of our continuous development in the crane engineering sector”, explains Andreas Hambrock, Head of the Universal Cranes’ Business Line at Terex Material Handling. “The new crane is an ideal supplement to our existing range of rolled and box-section girders. Its special design allows sensitive loads to be transported safely and precisely for indoor and outdoor applications. We are now well placed to meet our customers‘ specific load handling requirements, boost productivity and improve operating safety.” The new single girder Demag V-type crane may be used for various crane types, including overhead travelling cranes, suspension cranes, portal cranes and wall-mounted travelling cranes. About Demag/Terex Demag, one of the world’s leading brands for industrial cranes and crane components, is part of Terex Corporation’s Terex Material Handling business group. The Terex Material Handling business group sees its core competence in the development, construction and production of technically sophisticated cranes and hoists, the provision of services for these products and the manufacture of high-quality components. Terex Corporation is a diversified global manufacturer engaged in the mechanical and plant engineering sector. A core activity of Terex Corporation is the provision of reliable solutions to meet our customers’ needs for a wide range of applications such as construction and infrastructure, shipping and transportation, quarrying, refining, energy and utility industries and manufacturing. Terex reports in five business segments: Aerial Work Platforms, Construction, Cranes, Material Handling & Port Solutions and Materials Processing. Terex offers financial products and services to assist in the acquisition of Terex equipment through Terex Financial Services. Visit www.demagcranes.de and www.terex.com for further information. Terex Material Handling has completely redesigned the Demag KBK Aluline light crane system to create a versatile and ergonomic modular lifting and moving solution. Reduced rolling resistance enables operators to move loads weighing up to 2,000 kg, by hand, with minimum physical effort. The new light crane system comprises hollow section aluminium profiles, in four sizes, which deliver improved rigidity and a higher load capacity. In addition, all profile sections benefit from lateral slots, which are compatible with the ITEM system, making it an ideal platform for the addition of other industry standard accessories for bespoke solutions. The two larger KBK Aluline profile sections are available with optional integrated conductor lines, eliminating trailing cables, for improved functionality and a clean, modern appearance. The spectrum of applications for the light crane system ranges from small workshops to complex interlinked material flow applications, including semi-automated production operations. The system is particularly suited to the automotive industry, where high cycle times and precise positioning on production lines are prerequisites. The smooth operation of the KBK Aluline system, with low load dead weight, reduces operator fatigue whilst meeting demands for operational efficiency and safety. As an overhead handling system, KBK Aluline makes it possible to create almost any size of uspension crane or monorail system. Even greater versatility is afforded by a significant reduction in the number of suspension points required and a consequent increase in the distance between the profile section connectors and suspension points. The new sections are stronger and lighter, requiring less supporting structure, for reduced installation time and cost. The KBK Aluline system has been designed to be virtually maintenance free. All aluminium profile sections are compatible with existing Demag KBK steel and Aluline profile sections, allowing them to be combined for the upgrade and extension of existing material handling installations. By installing or upgrading to the smooth running characteristics of KBK Aluline, noise levels are also reduced for an improved working environment. Terex Material Handling offers a free consultancy and advice service to customers, through its own experienced local support engineers, and via a nationwide dealer and OEM programme. Konecranes Demag UK Ltd is one of the worlds leading brands for industrial cranes and crane components with a UK subsidiary and other subsidiaries and partner agencies across the world. We manufacture in 16 countries on five continents and operate a sales and service network in more than 60 countries. We offer our customers a complete range of cranes, drives and handling technology for every application. These solutions provide our customers with valuable quality and efficiency benefits. In small workshops as well as in major industrial enterprises. Our extensive product range includes a wide range of solutions for specific industries for travel applications, load handling at the workplace and material flow in production and storage. The Demag crane experts always focus on the benefits for our customers  the greatest possible efficiency and reliability, optimum availability.